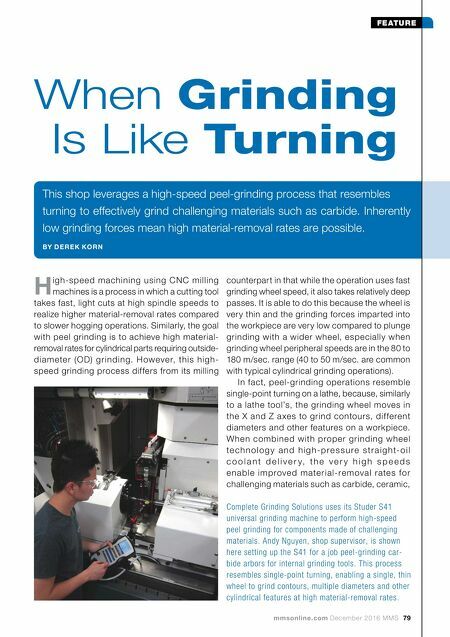 mmsonline.com December 2016 MMS 79 FEATURE H igh-speed machining using CNC milling machines is a process in which a cutting tool takes fast, light cuts at high spindle speeds to realize higher material-removal rates compared to slower hogging operations. Similarly, the goal with peel grinding is to achieve high material- removal rates for cylindrical parts requiring outside- dia m ete r (O D) gr inding. Howeve r, this high- speed grinding process differs from its milling When Grinding Is Like Turning This shop leverages a high-speed peel-grinding process that resembles turning to effectively grind challenging materials such as carbide. Inherently low grinding forces mean high material-removal rates are possible. BY D E R E K KO R N counterpart in that while the operation uses fast grinding wheel speed, it also takes relatively deep passes. It is able to do this because the wheel is very thin and the grinding forces imparted into the workpiece are very low compared to plunge grinding with a wider wheel, especially when grinding wheel peripheral speeds are in the 80 to 180 m/sec. range (40 to 50 m/sec. 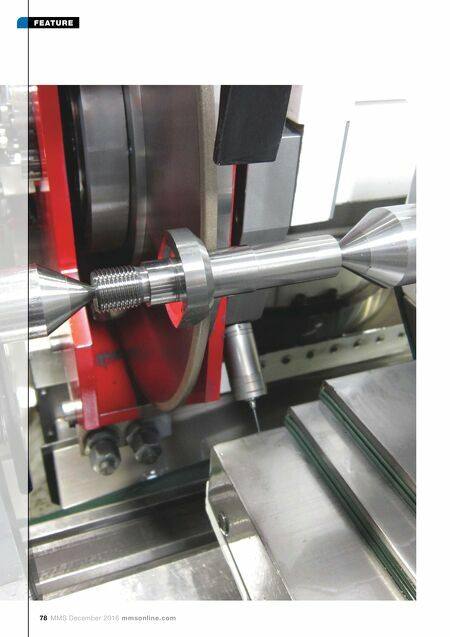 are common with typical cylindrical grinding operations). In fact, peel-grinding operations resemble single-point turning on a lathe, because, similarly to a lathe tool's, the grinding wheel moves in the X and Z a xes to grind contours, dif ferent diameters and other features on a workpiece. When combined with proper grinding wheel te c h n o l o g y a n d h i g h - p r e s s u r e s t r a i g h t- o i l c o o l a n t d e l i v e r y, t h e v e r y h i g h s p e e d s e n a b l e im p rove d m ate r i a l-re mova l rate s fo r challenging materials such as carbide, ceramic, Complete Grinding Solutions uses its Studer S41 universal grinding machine to perform high-speed peel grinding for components made of challenging materials. Andy Nguyen, shop supervisor, is shown here setting up the S41 for a job peel-grinding car- bide arbors for internal grinding tools. This process resembles single-point turning, enabling a single, thin wheel to grind contours, multiple diameters and other cylindrical features at high material-removal rates.